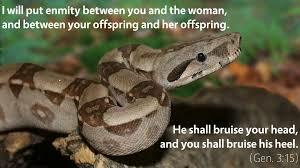 Not long after Creation, in the book of Genesis, Satan disguised as a serpent fooled Eve into eating from the Tree of Knowledge of Good and Evil. The one tree they were told not to eat from. Again, although this seems to indicate immediate action (as with You Will Surely Die), it doesn’t necessarily reflect that. God’s actions are not necessarily immediate. The initial seed of Eve is Abel, who is murdered by his brother Cain. At that point a new seed of Eve is necessary and that seed is the third son, Seth. All humanity follows a line from Adam and Eve through Seth. The most important person in that line is our Lord and Saviour Jesus Christ and He is also the seed of Eve. We know there is enmity between Jesus Christ and Satan, and we also know that Satan wants to regain his position. Christ died on the cross as a sinless man, and in doing so defeated Satan. Because Christ took all of our sins with Him, Satan’s defeat occurred because Satan no longer had dominion over the earth. Christ’s crucifixion and ressurection took that from him. Christ ultimately bruised Satan’s head!